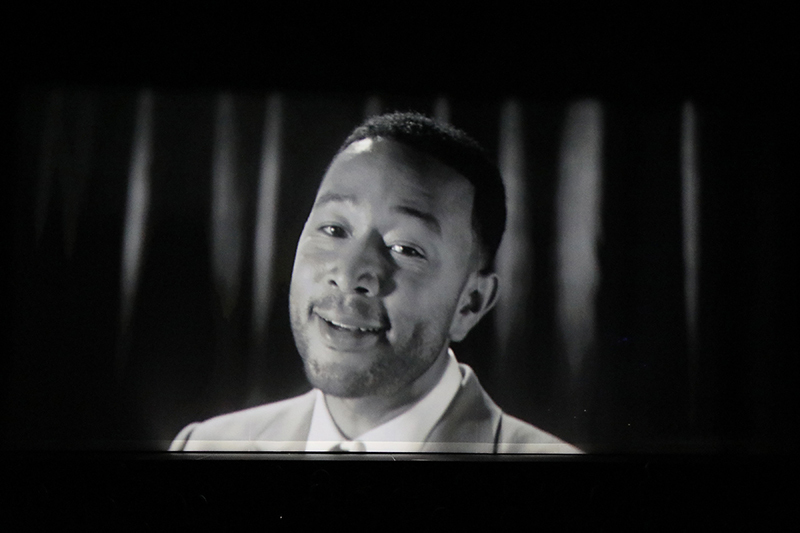 In late October, John Legend released his sixth studio album, A Legendary Christmas, with reworked holiday standards mixed in with six original songs. 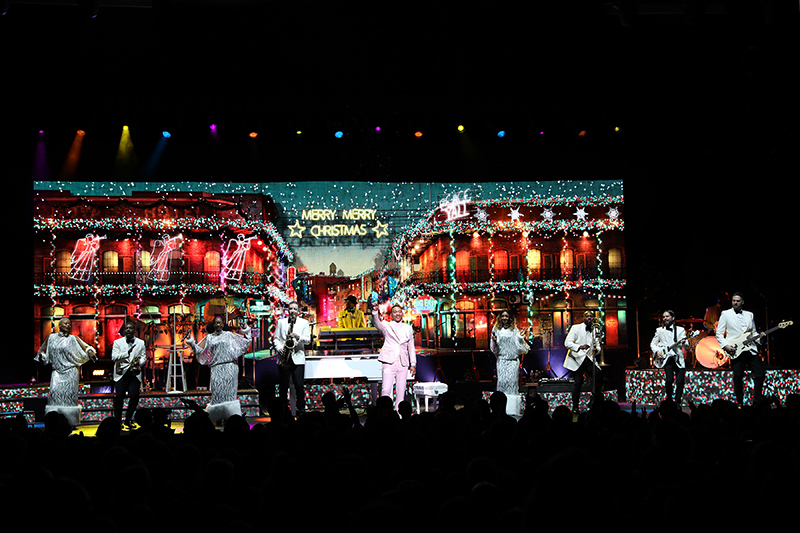 In November and December, he took his Christmas show on the road with a special production designed by Rob English, one of the partners involved in a company out of Los Angeles called Friends at Work. 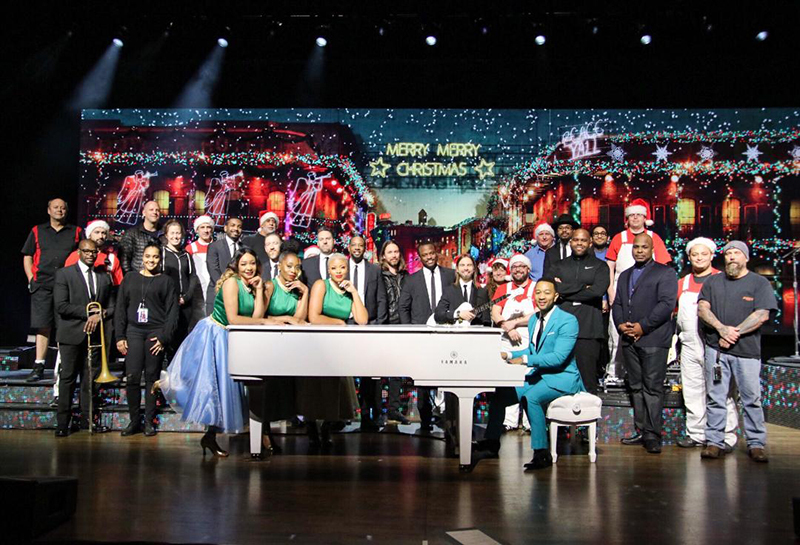 The band and crew join John Legend on stage. Friends At Work was founded in 2015 with the mission of curating and supporting culturally transformative artists and initiatives. It is all about creating a 21st century entertainment, innovation and social impact company that supports programs for positive change. They work on projects such as #freeamerica, the Show Me Campaign and Native Americans in Philanthropy. Included in all this is the management of several musical artists. About four years ago, Rob started doing some creative work with John Legend, who has been managed by Friends at Work founder and CEO Ty Stiklorius for many years. 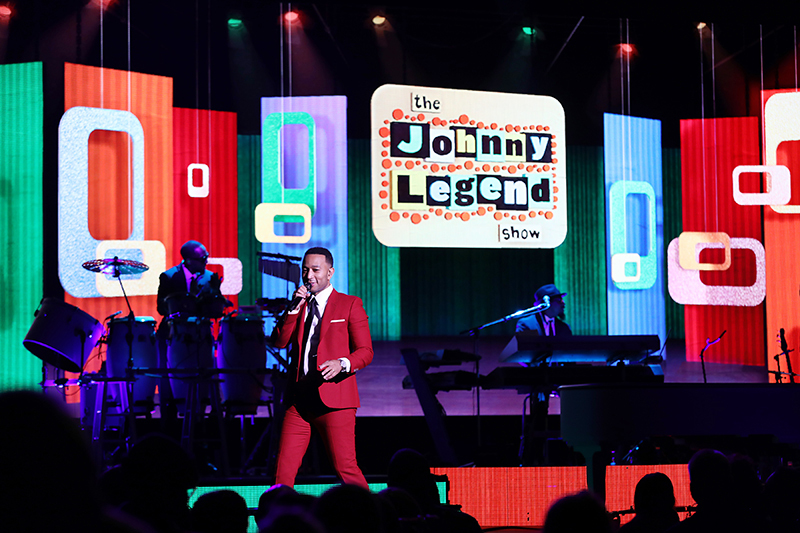 A Legendary Christmas starts with a sheer scrim in place downstage and an opening video of John performing “Chestnuts Roasting” similar to the way Nat King Cole did his version more than 60 years ago. “We filmed John singing the song in black and white, with the media massaged to look a little grainy, like the films of old. As the video ended, the scrim flew out revealing John and the band. My idea was to start the next few songs in some basic white and minimalistic color looks. The mid-20th century staging design consisted of some individual circular risers for five of the band members. 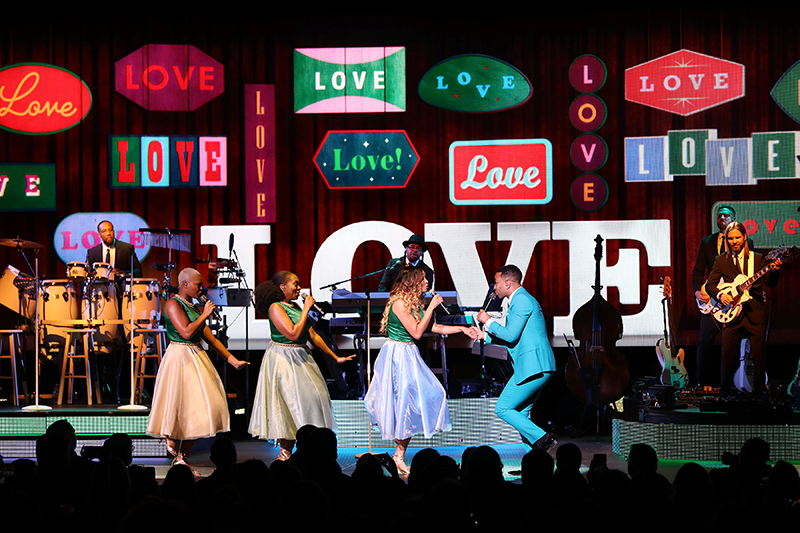 There were also two staggered risers offstage with the three-piece horn section on one and the three female backing vocalists on another. 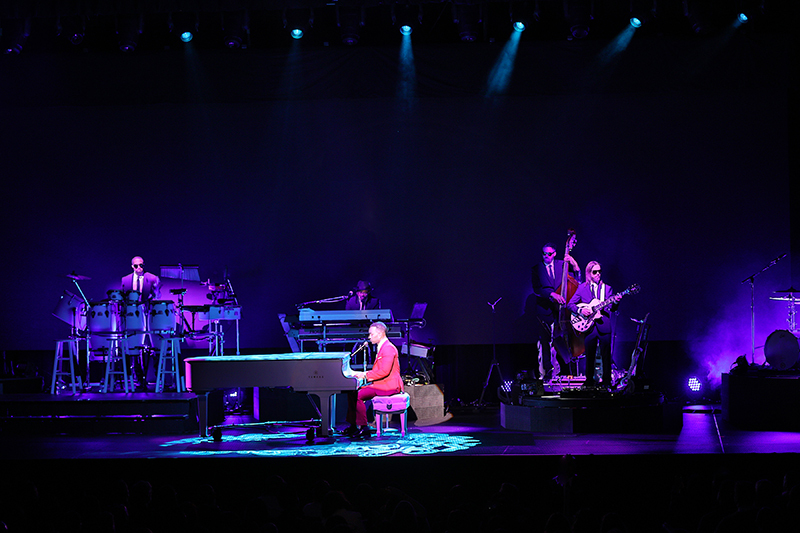 Members of the 11-piece band were all located just upstage of the center piano. Gallagher Staging, a longtime vendor for this artist, provided the set. 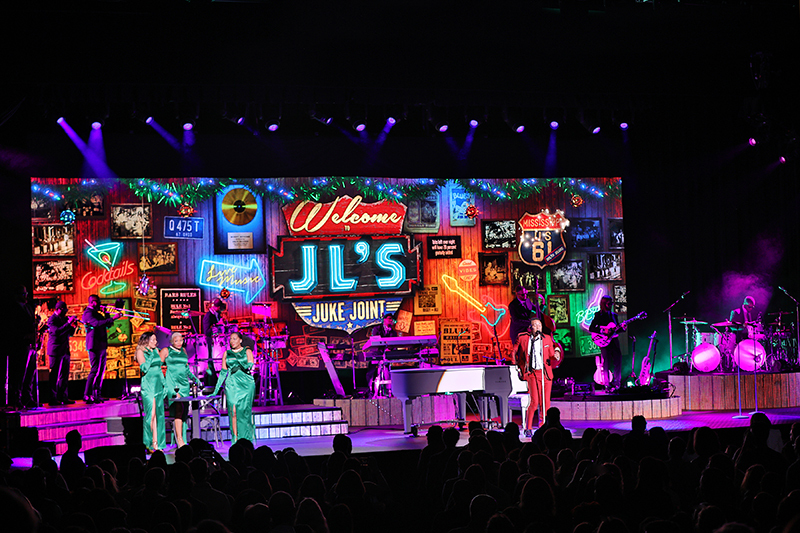 “We chose to use the video with the set to create an illusion that we have a constant array of stage sets,” English says, noting how the band would play in front of a juke joint during an upbeat Motown song to add to the show’s theme. The risers and step units were lined with LED displays that matched resolution with the upstage video wall. English’s design called for a 40-foot-wide LED wall that was only approximately 10 feet tall. “We thought of the rear wall as a digital backdrop that the band played in front of, but it never overpowered the production. In fact, the rear light truss is trimmed at about 18 feet high.” There were no cameras in use, just the content specifically designed for this show. 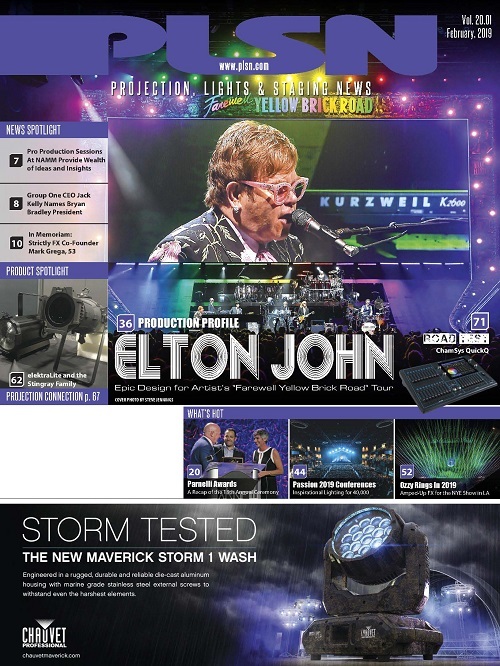 LMG provided the disguise 4×4 media server and all the LED displays for the show. Friends At Work likes using them when possible. The disguise server would be run with time code, but the lighting was not. John is known to stop playing and talk to the audience at times, so this process made sense. The Pro Tools rack backstage fed the server. The media content was made under Rob’s direction. He utilized the skills of We are Shop from the U.K. and Sing Sing from Los Angeles. Friends at Work added additional content and editing, with a team of artists on hand at tech rehearsals working on the media as it was programmed with the lighting. Rob designed a basic lighting grid that included a front and rear truss along with some side lighting. The rig was full of only hard edge light fixtures that were all Robe BMFL spots and Martin MAC Viper AirFX. Some footlights helped illuminate the band members while a row of Mac Auras provided shafts of color from the upstage floor. 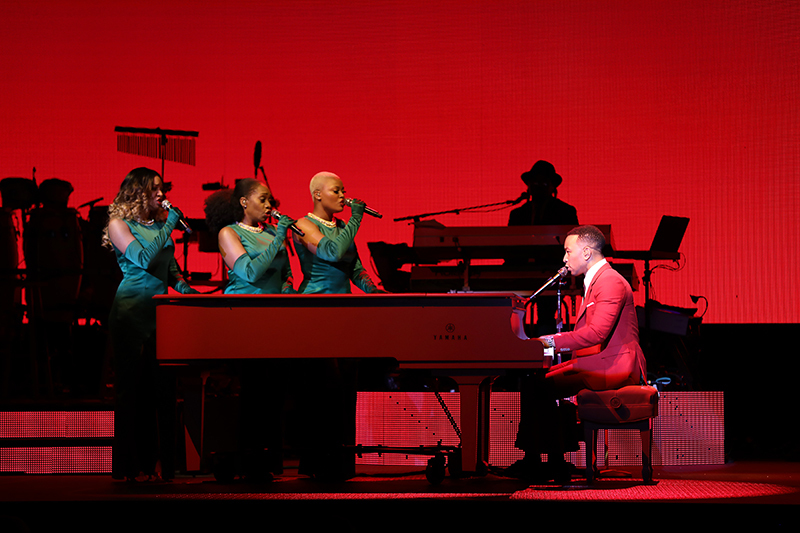 Once the plot was done, production manager Chris Stinebrink handed it off to Upstaging, the preferred vendor of John Legend for the last five tours. 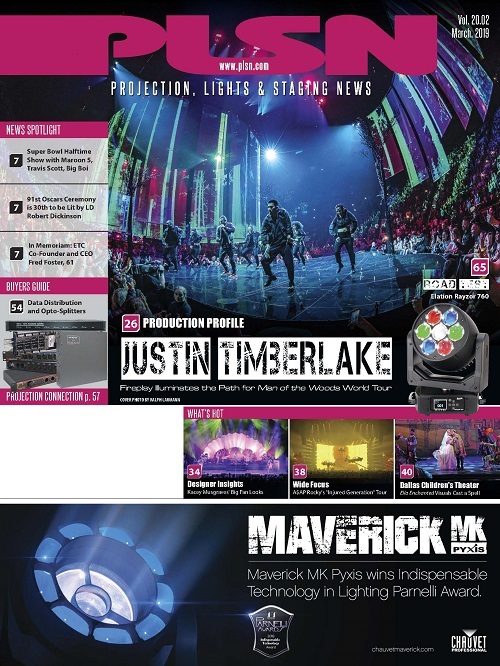 By using Upstaging, Stinebrink was able to secure the exemplary previz suite for a week of tech rehearsals that Rob and his design team could use to get the show together. 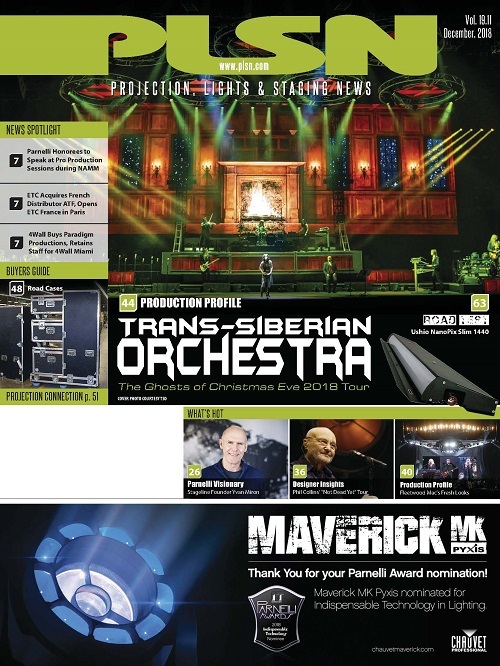 Lighting director Hal Deiter has been behind the grandMA2 lighting console for most of Legend’s shows the last few years. Stinebrink called him back in to direct the tour, which included calling all the fly cues along with spotlights. 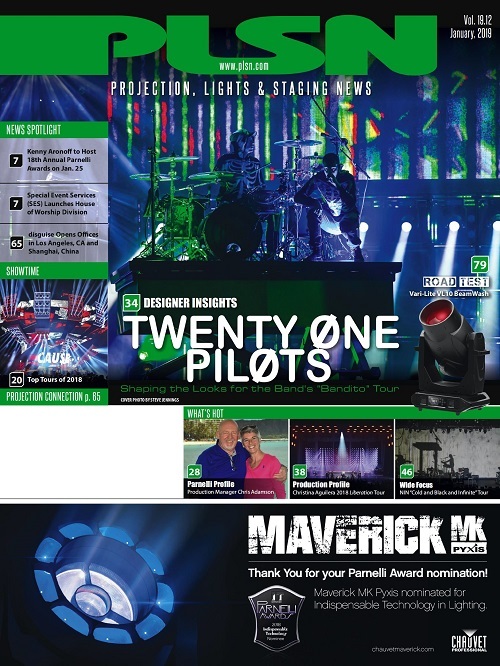 “The one thing we didn’t get together until the last minute was an actual lighting designer to help bring my vision to fruition,” explains Rob. 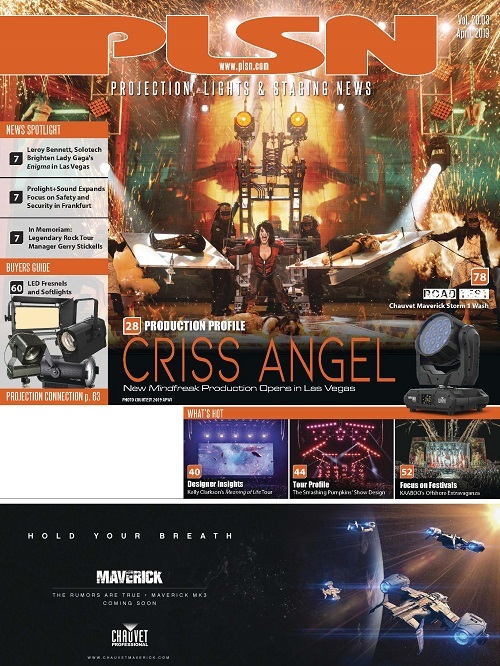 “I knew the video content and flow I wanted, but we needed someone to make the looks shine and orchestrate the movement of the lighting.